Welcome to Nudgespotting! Every other Monday we'll take a quick look at some real-world nudges, with a healthy dose of commentary and behavioral references. 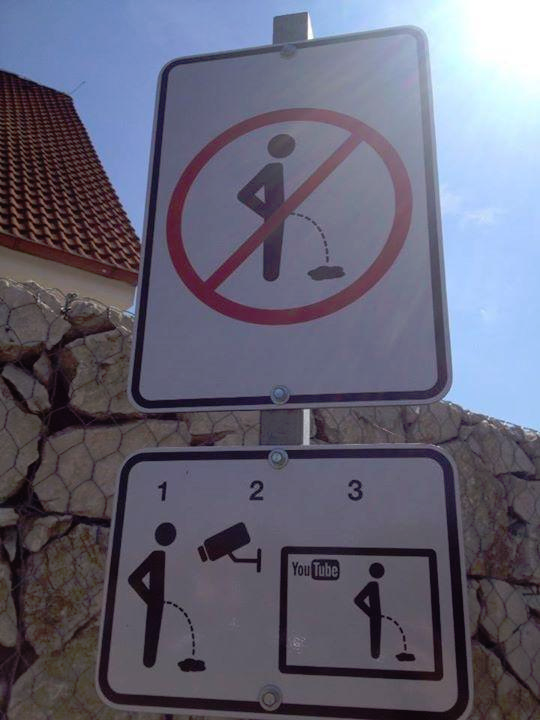 Okay Nudgespotters, we've got our quirkiest theme yet - nudging to discourage public urination. Below you’ll find a few designs that attempt to quell these acts. Dhaka, the largest city in Bangladesh, had previously tried to dissuade their citizens from urinating in public by painting red warning messages on walls, with arrows pointing to the closest bathroom (the city has 10,000 mosques, all of which have public bathrooms). But their initial message wasn't very effective. "Naaya Nee?" (Are you a dog?) - that's the slogan written on a wall in Chennai along with a drawing of a dog. The intention is to keep everyone at bay, no matter how pressing nature's call. The simple, minimalist sketch, which first sprung up on a few defaced walls in the city, is now turning into a movement, spreading from wall to wall with the hashtag - #WakeUpMadras. WakeUpMadras is not just the first underground street art project in Chennai - it's also an indication of a paradigm shift in the city's wall art culture. This sign was put up by Hotel Marcinčák in the Czeck Republic. We might feature you in an upcoming post!